Today I asked God to show me how I can be a blessing to others. So I went to the the shopping centre and I had noticed a dramatic change in one of the stores. It wasn’t vibrant and popping with colour, the shelves looked sparse and the person behind the counter was not who I remembered. While I was browsing, I heard the person behind the counter talk to one of his regulars, it wasn’t a comfortable conversation but he told the customer that he was closing shop. Well, I have been doing prayer healing for four years now, so when I heard this, my heart leapt and my immediate response was to reach out to the owner. So I did, I asked him what was happening and he told me his sad story. He told me that he bought the business and the papers were all legitimate and after the trial run, everything looked fine but apparently they weren’t. Business was not as it seemed, he couldn’t pay the rent, the centre management was on his back and that he was on the verge of losing his house. He told me that he had been a good person all his life, worked as a teacher for many years and this was his life change. I asked him if he was a praying man and he said no! I told him he had nothing to lose. He replied saying that he didn’t feel right or deserving, that he shouldn’t ask God at this point. I told him that it’s exactly at this point that he should get on his knees and surrender to God. God knows all His children, especially during difficult times He expects us to draw near to Him. In God’s realm there is no present, past or future, your life was mapped out for you, at birth. God has treasures stored up for you, all you have to do is claim them. “What better time to claim them than now,” I said. “But God doesn’t know me,” he said. My point to all this is that God knows us by the hairs on our heads, He knows all our coming and goings, he knows us up close and personal. He wants us to ask and to ask big!!!!!! Isn’t He the God who breathed life into us? Isn’t He the God who gave us the earth, mountains, sea etc…? The God who parted the Red Sea? The God who raised Jesus to new life? So what is the difficulty in God paying someone’s bills? Helping a person in need? It’s a piece of cake for Him and you don’t even have had to earn it! Allow God to be your Father! What does a father want for his children? He wants the best for them and the opportunity to help them when asked. Prayers are answered when they’re prayed. All you have to do is have faith. GOD COULDN’T HAVE MADE IT ANY EASIER!!!!! 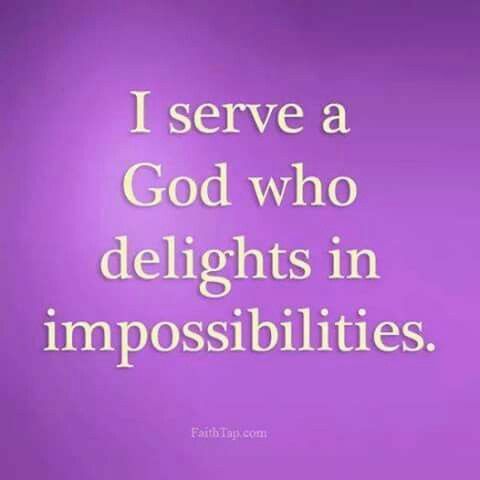 We are children of the most high God, to a God of impossibilities who makes all things possible. I left saying that I would pray for him and then asked God to take care of business. That night I thanked God for the opportunity of serving Him because my life has been blessed in so many ways and it’s all because of Him. Humble yourself before God and He will give you the desires of your heart.